The best power roller will make painting exterior and interior surfaces efficient, as it contains a system that continuously supplies paint into the roller, which translates into lesser trips to the paint bucket. Choosing the right power roller is important to ensure quick accomplishment of painting jobs, especially those that cover a large area. Different surfaces require varied painting techniques and tool specifications, which makes choosing the right power paint roller even more challenging. You have to consider the right size of the roller based on the size and type of the area to be painted, quality of roller cover, and length of the nap, to name a few. These will all affect how the paint is applied on the surface and if it will result to even spreading with no mess involved. The first step in choosing the right power roller is deciding on the most important part of the system—the paint roller. Familiarizing the size and dimensions of the surface to be painted is essential to determine the right size of the roller. The larger the surface, the wider the paint roller in the system should be. This will allow for better coverage in just one swipe of the roller and thus, saving you time and energy. Paint rollers come in 90 millimeters to 450 millimeters in width. Aside from the width, the size of the roller also matters. If a power roller system includes more than one size of roller in the package, you will be able to paint more areas plus the edges. The next aspect you have to consider is the nap length of the roller. The nap length will determine how the paint is spread. The length can range from 1/16 inch to 1.5 inches. Smooth surfaces demand for shorter nap lengths whereas rougher surfaces necessitate longer ones. ​The last characteristic of the paint roller that must be considered is the cover. The suitable cover depends on the type of paint to be used and the surface where the paint will be applied. Polyester and nylon fibers are best used for latex paint while mohair, lamb’s wool, and other natural hair fibers are best for oil-based paint. For porous surfaces, you need to use a sponge roller to achieve a glossy and smooth finish. Choosing the right cover is critical since it will affect the even spreading of the paint on the surface. High quality covers will absorb the paint and transfer it to the surface without its fibers shedding while you work. ​Now that you have learned what characteristics to consider with the paint roller, the next step is to look at other aspects of the system. Take into account the ease of use of the tool. It should be user-friendly and not require complicated actions to connect the paint bucket and start the flow of the paint into the roller. The Wagner 0530002 is included in the line of SMART Power Roll Systems from its manufacturer. 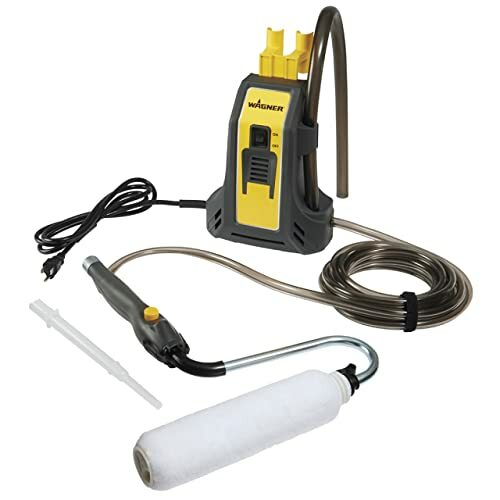 It is designed for accomplishing a variety of painting projects. This power roller directly feeds the paint into the roller making the task easier and more efficient. It comes with variable speed control from 1 to 9 enabling you to adjust the rate of flow of the paint from the bucket to the roller. The Wagner Power Roller Plus is a cordless machine with variable speed output. 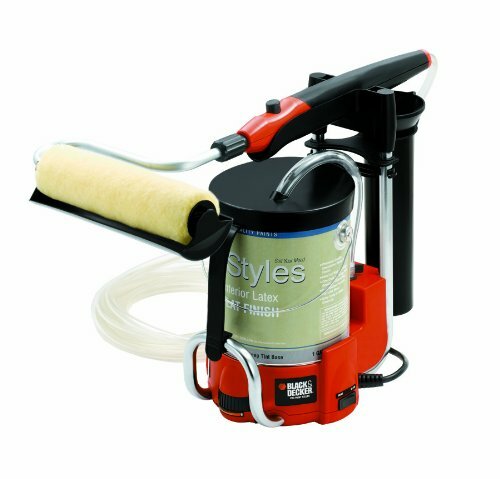 You can adjust the delivery rate of the paint from the paint canister of the unit to the paint roller depending on the size of the surface you are painting and the speed at which you are applying the paint. The unit is quite easy to bring since it can be carried on your shoulders and ready for use. The Wagner 0530010 is a recent innovation of its manufacturer’s power rollers. The design of the unit includes the direct-feed from the paint gallon to the roller for continuous painting. It makes way for drip-free painting as well. 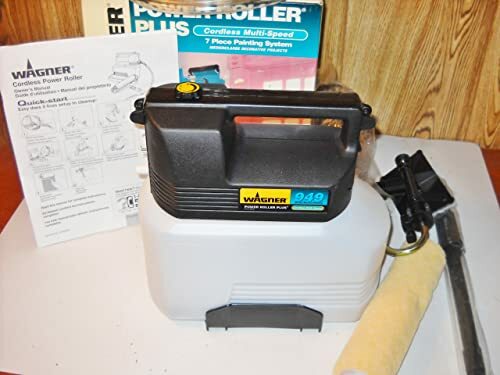 The unit can accommodate 1 to 5 gallon paint containers with its click-attach arm adapter. The easy setup allows for a quick start in using the machine. Its auto-feed control provides the paint flow fast enough while providing even coverage. This power roller is suitable for huge painting projects in multiple rooms. High places such as ceilings can be reached through the extension connection handle included in the product package. Cleaning the unit can be done within 10 minutes. The Black & Decker C800659 pumps the paint from the can right onto the paint roller thereby eliminating the need to use a tray. 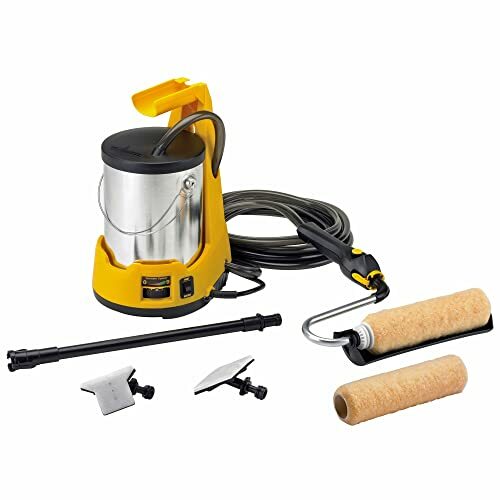 This cuts down the mess when painting and eliminates the tasks of filling up the tray back and forth to the paint can, making the painting task more efficient. It comes with a long 20-foot hose to accommodate longer distances and bigger areas when working. This allows you to keep the machine in the same distance while you move as you paint. The unit features the paint saver where in unused paint is pumped back into the paint can. It also comes with spatter shields to further lessen the mess when painting. Has a spatter shield to prevent mess on walls and floors. Comes with a roller keeper for easy storage of wet roller. Suitable for painting big and wide surfaces. 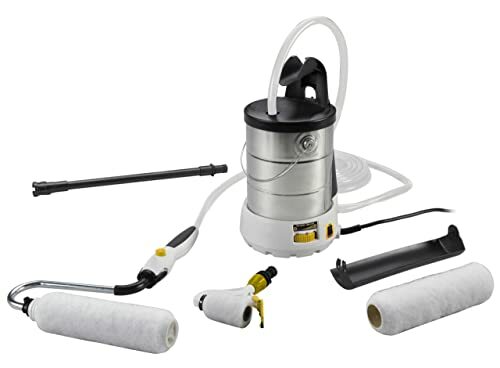 The Wagner Power Roller is a complete painting kit for large applications as well as trim and corner painting. The product package includes trim and corner pads to ensure accurate and mess free painting on these smaller areas.